Solar power gets a ton of attention as one possible answer to our energy needs. The fact is that using the sun's energy just makes sense for our future. But utilizing solar power is still out of reach for most homes and businesses, and probably will be for a couple more years. One great application for photovoltaics right now: remote power. There is no better option for powering electronics in a location with little or no access to traditional power sources. Let's talk about what goes into system design and applications for photovoltaics in far off locales. 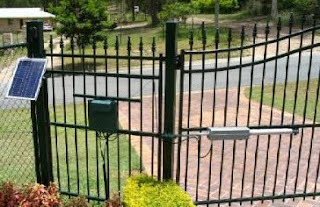 A gate enclosure is a great way to use the sun in a location that doesn't have power handy. As with any electrical installation, you first need to decide just how much power is needed. This is especially critical with PV since it most likely will be the only power source. We'll need a conservative estimate of the amperage, voltage, and the time of usage to size the system. When doing this, don't forget that most devices have a spike in the amperage upon start-up. Some devices use five times their operating amperage briefly when starting. Most electronic devices are built to take AC power since that is what our grid provides. Since solar generates DC power, we often need to use an inverter to convert DC to AC. If we can avoid this, we'll save both the expense of the inverter and anywhere from 5-20% of the power that we would lose in inversion. Often times the expense of using DC devices is offset by the savings on an inverter and reducing the wattage of solar power kit. Using AC and DC electronics increases the complexity of the install but can be accomplished with proper design. When designing a system one of the most critical factors is what we call 'days of autonomy'. This translates to how long the system would run if there was no sunshine. This is important because going from one day of autonomy to three days of autonomy would triple the size and expense of the system. Usually the days of autonomy depends on whether the system is critical or non critical. An example of a critical application might be a traffic warning light or a communications system. For either case, you must take into account local weather patterns and determine what a likely scenario is for days without sunshine. For critical applications we might double or triple that time. In non-critical instances we might not add any days of autonomy depending on budget. For most part of the US, in semi-critical applications (ie lighting, security, signage) we would plan for 3-4 days of autonomy. How the system is installed is important since most of these systems will need to operate with minimal maintenance. Generally smaller systems need pole mounts and battery enclosures to keep the weather out. Sealed or AGM batteries are preferred in these systems since they don't require maintenance or ventilation. Another design consideration is wind load, snow load, and hail damage, since the remote locations are often exposed to extreme weather. Many remote solar power kits now come with the electronics, solar panels, and enclosures in one complete unit that can be transported to the site ready and set up in very short amount of time. Electronic Monitoring. Weather stations and water monitoring stations are perfect uses for PV and usually can be powered cheaply and reliably. Oil field monitoring is another area that is perfectly suited for remote power solutions. Lighting. With the advances in LED and CFL lighting fixtures nearly any lighting setup can be powered with solar now. More and more we will see traffic, parking lot, and street lights powered with PV. Small Moving Parts. Smaller moving parts that have intermittent use such as gate and garage openers can be powered by the sun. It is advisable to have a manual override so in case of power failure you can still get in or out. Communications. Cell phone and communications repeaters are increasingly using PV as systems they are being installed in more and more remote locations. These can often be coupled with wind generators since they tend to be installed in high places. Computers and Modems. Most computers and modems now use very low wattage and can be custom made for DC systems. Small Volume Pumping. A 'direct solar' system can be designed to pump during sunny hours and then store the water using tanks, instead of storing the electricity with batteries. Security Cameras and Recording Devices. If you've ever though about putting a camera in a far corner of your lot to monitor those pesky prowlers, you've no doubt wondered how you would get power to the spot. Now with a simple pole mounted panel and battery box you can power the camera, motor, and recoding device. Cabins and Cottages. Remote homes can now be powered fairly easily with solar. The system should be designed for the owners usage patterns, but its best if heating, cooling, and refrigeration can kept out of the electrical circuit. Propane refrigerators, wood stoves, and natural cooling techniques will keep power systems simple and affordable. These system almost always need a backup as well, such as a gas generator. Kriss Bergethon is a writer and retailer of solar panels from Colorado. Did I mention John Stewart is back on the job?! Will there Be a Bill this Year? What Will it Look Like? Join theEnergyCollective.com and WattHead.org's Jesse Jenkins for a Live Webcast September 30, 1 PM EST / 10 AM PST. Register here today. Todd Stern, the U.S. State Department lead negotiator, has urged Congress to act. How critical is it that the U.S. climate negotiators have a bill this year? Would a strong bilateral China-U.S. agreement before December be sufficient instead? In the Senate, what type of climate and energy bill has the greatest likelihood of passage, and how will it differ from the House version? Do you agree with TEC blogger Joe Romm of climateprogress.org that there could be a “better” climate bill next year? To explore these issues and to answer your questions about the current legislation, The Energy Collective and several of its members are presenting a live interactive panel discussion on September 30, at 1 pm Eastern. We hope you will join us. What are the sections of the bill that have the greatest support? Is there any chance of a bi-partisan bill? If so, what is required for Republican support? What role will nuclear play in the climate legislation? Will the new nuclear title negotiated over break remain intact? Will there be greater support for loan guarantees? What about oversight for carbon markets, as addressed in the House bill? Will there be more concessions and free allowance allocation to carbon producers (oil & gas, utilities, industrial manufacturers) in the Senate version? Will a safety valve be necessary politically, and to ensure carbon permit prices are stable and predictable? How strong will international trade protection be? Will Obama reconsider mandatory border-tax adjustments to protect U.S. industries? What role will the EPA play in the negotiations? If legislation is not enacted this year, what constructive action, if any, can the U.S. government take at Copenhagen? Jesse Jenkins is Director of Energy and Climate Policy at the Breakthrough Institute, and is one of the country's leading energy and climate policy analysts and advocates. Jesse has written for publications including the San Francisco Chronicle, Baltimore Sun, Yale Environment 360, Grist.org, and HuffingtonPost.com, and his published works on energy policy have been cited by many more. He is founder and chief editor of WattHead - Energy News and Commentary and a featured writer at the Energy Collective. Jesse goes by @JesseJenkins on Twitter. Michael Zimmer is counsel practicing in the Energy group at Thompson Hine LLP, with a focus on energy regulation, climate change and energy corporate acquisition and finance transactions. He has been involved in assignments in non-utility generation, renewables, gas and electric, emissions credits, rural cooperatives, energy and emissions trading, and manufacturing industries. Michael is also currently national co-chair of the ABA Renewable Energy and Distributed Generation Resources Committee, and ABA Vice Chair of the Committee on Energy & Environmental Finance. Manik Roy is the Vice President of Federal Government Outreach for the Pew Center on Global Climate Change, where he manages communication between the Center and the U.S. Congress. Dr. Roy has twenty-five years of experience in environmental policy, having worked, before coming to the Pew Center, for Senator Frank R. Lautenberg, Representative Henry A. Waxman, the U.S. EPA, the Massachusetts Department of Environmental Protection and the Environmental Defense Fund. Dr. Roy holds a Ph.D. in public policy from Harvard University and a Master of Science degree in environmental engineering from Stanford University. The large decline in U.S. emissions in 2008 and 2009 due to the economic recession means that if the House-passed Waxman-Markey climate legislation becomes law, the bill's emissions reduction cap will require no reduction of carbon emissions over the first two to five years of the program. The resulting oversupply of emissions permits will allow regulated firms to continue business as usual emissions through as late as 2018, according to a new analysis by Breakthrough Institute based on new Energy Information Administration emissions projections that take into account the impacts of the global recession. The analysis further establishes that very modest utilization of the offset provisions of the Waxman-Markey bill, as little as one-tenth to one-quarter of the levels of offset utilization projected by the Congressional Budget Office and the Environmental Protection Agency respectively, will allow emissions in regulated sectors of the U.S. economy to proceed at business as usual levels through 2020 or beyond. Depending upon how quickly U.S. emissions recover over the next decade, firms would need to purchase on average as few as 124 million tons of offsets annually in order to comply with the emissions reduction caps through 2020, substantially less than the 526 million and 1,223 million tons of average annual offset utilization between 2012 and 2020 projected this summer by CBO and EPA respectively. In conjunction with the free allocation of a high percentage of emissions allowances under Waxman-Markey and lower global demand for offsets from recession-hit EU and U.S. firms, substantial over-allocation of emission allowances in the early years of the program, will likely lead to a cap and trade program awash in both cheap emissions allowances and offsets over at least the first decade of implementation. Under such conditions, the functional carbon prices for the first decade or more under Waxman-Markey are likely to hover at or even below the $10 per ton floor on allowance auction prices (rising slowly each year) established by the bill. The reason for this projected over-allocation of pollution allowances is because the House cap and trade legislation would initially distribute allowances based on 2005 emissions levels, which were much higher than 2008 or 2009 levels. By the time the Waxman-Markey emissions cap would go into effect in 2012, U.S. emissions may still be recovering to pre-recession levels and may remain substantially lower than historic 2005 levels. To test potential economic and emissions recovery scenarios, Breakthrough Institute used economic recovery forecasts from the EIA and the U.S. Congressional Budget Office (CBO), and greenhouse gas emissions projections from the EIA and U.S. Environmental Protection Agency (EPA), to construct two emissions recovery scenarios -- a "slow recovery" scenario and a "fast recovery" scenario -- to provide a range of outcomes. Under the slow recovery scenario, U.S. emissions remain seven percent below 2005 levels in 2012; under the fast recovery scenario they are three percent below 2005 levels in 2012. Under the slow recovery scenario, relatively low business-as-usual (BAU) emissions projections and the banking of excess permits by firms means that the Waxman-Markey cap would not require firms to reduce emissions at all -- either themselves or through purchasing offsets -- until 2018. Under the fast recovery scenario, emissions reductions would not be required until 2014. Slack demand and the resulting low price for pollution permits would create a strong incentive for firms to hedge their future carbon liabilities by buying and banking emissions credits while they are in excess and prices are low, building up a bank of permits for the future while continuing with business-as-usual practices. Furthermore, even if they utilized just a fraction of available offsets each year, U.S. firms would not be required to reduce their own emissions until even as late as 2030 or beyond. Depending on how quickly the economy recovers and emissions rise, firms would need to use just 6 percent to 25 percent of the total amount of offsets permitted under the House bill for emissions levels to rise at business-as-usual rates through 2020, and only 43 percent to 66 percent of total offsets to continue emissions growth through 2030. The Waxman-Markey floor on permit prices would prevent the auction price of carbon dioxide in the primary auction market from dropping below $10/ton. However, with the majority of permits given away for free in the first decades of the Waxman-Markey cap and trade program and a substantial over-allocation of permits projected in the early years of the program, the correspondingly slack demand for permits may result in a large secondary market for emissions allocations in which permits trade for substantially less than $10/ton. The result of such an outcome would be a functional carbon price substantially below the nominal $10/ton floor established through the statute for the primary allowance market. Even at the auction floor price, the carbon price is unlikely to be sufficiently high to act as a strong incentive for firms to improve their energy efficiency at above-BAU rates, or to shift to low-carbon power sources. A carbon dioxide price of $40 per ton in the EU in 2008 was not high enough to derail European plans to build 50 new conventional coal-fired power plants over the next five years, for example. Just six percent of the total offsets permitted under the House legislation would need to be purchased for firms to meet their 2020 emissions reduction requirements, under the slow recovery scenario and 43 percent would need to be purchased by firms to meet their 2030 requirements. Under the fast recovery scenario, 25 percent of the total permitted offsets would need to be utilized for firms to meet 2020 emissions reductions requirements, and 66 percent to meet their 2030 requirements. Both the CBO and EPA analysis of the ACES legislation project significant utilization of emissions offsets. CBO's relatively conservative offset projections forecast 26% of total permitted offsets will be used through 2020 and 38% through 2030, while EPA's more generous projections forecasts 61% of total permitted offsets will be utilized through 2020 and 64% will be used through 2030. Under either set of assumptions, the total supply of permits and offsets created under the ACES cap and trade program would legally permit U.S. emissions to continue at BAU rates through most if not all of the next two decades. And with emissions down in the EU and across the globe due to the recession, demand for offsets from the European ETS and other emissions trading programs will be down as well, increasing the likely supply of offsets at affordable prices. The global recession is expected to drive the biggest annual drop in global greenhouse gas emissions in forty years this year. With full economic recovery in the U.S. and globally likely to take several years, the latest projections from the EIA have revised downwards expected greenhouse gas emissions levels. EIA projects U.S. emissions from the burning of fossil fuels will fall six percent in 2009, after dropping three percent in 2008. Emissions would rebound slightly as the economy begins to recover, rising less than one percent (0.9%) in 2010 in the EIA's projections, but may not fully rebound to historic 2005 levels until well past 2012. In the slow recovery scenario, U.S. emissions follow the projections in the new EIA Short Term Energy Outlook (September, 2009) report through 2010, before returning to the long-term growth rates projected in the EIA's Annual Energy Outlook 2009 from 2011 through 2030. The fast recovery scenario reflects the more optimistic economic forecasts contained in the CBO's most recent economic forecasts (August, 2009) and slightly higher emissions intensity rates (the amount of CO2 emitted per unit of economic activity) in the EPA's analysis of the ACES legislation. A full spreadsheet of assumptions and calculations can be downloaded here (.xlsx file). These scenarios are depicted in the graphics below (click any to enlarge). Speeches made today at the UN's climate summit may have left much to be desired in the eyes of countries eagerly hoping for the U.S. and China to make specific commitments to emissions reductions in the run-up to climate negotiations in Copenhagen. Yet, willingness on the part of both nations to invest in clean energy technology may signify more direct action to mitigate climate change than any potentially empty emissions promises. "Climate change is an environment issue, but also, and more importantly, a development issue. We should and can only advance efforts to address climate change in the course of development...Out of a sense of responsibility to the world...China has taken and will continue to take determined and practical steps to tackle this challenge,"
While international leaders have put considerable effort into cajoling China, not to mention India, to accept binding emissions reductions targets by the time climate negotiations commence in Copenhagen this December, China's planned stimulus investment of $440-$660 billion in clean energy over the next ten years is far more indicative of China's willingness to mitigate climate change as it simultaneously grows its own economy. China is already the world's leading solar manufacturer and the government has announced plans to instate a feed-in tariff for solar electricity. In the last month alone, the Chinese government has announced a deal with First Solar to build a 2 GW solar power plant, the world's largest, and offers significant subsidies and incentives to its other clean energy sectors, promoting their rapid expansion. Though it already leads the world in carbon emissions, China's investments in clean energy to mitigate and eventually supplant its dependence on fossil fuels, primarily coal, are more direct measures to fight climate change than emissions targets, which have not been proven achievable by Kyoto Protocol signatories attempting to meet them for the last decade. 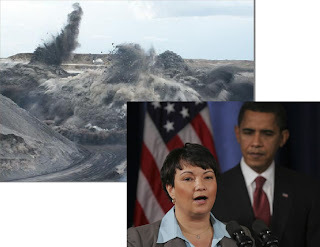 The U.S. has also received considerable criticism from the international community demanding a firm stance and leadership from the Obama administration by the time climate negotiations commence. Obama's speech this morning, which dubbed the climate change threat "serious," "urgent," and "growing," did little to quell international disappointment. "We are making our government's largest ever investment in renewable energy -- an investment aimed at doubling the generating capacity from wind and other renewable resources in three years. Across America, entrepreneurs are constructing wind turbines and solar panels and batteries for hybrid cars with the help of loan guarantees and tax credits -- projects that are creating new jobs and new industries." Reaching a global climate treaty in Copenhagen seems to be contingent on global acceptance of binding emissions targets, but critics who claim both the U.S. and China are not taking action on climate change, discount the critical importance of their investments in clean energy. While emissions targets may symbolize direct action against climate change, without the kind of direct investments to transform the way nation's make and use energy already begun in China and the U.S., these "commitments" will prove empty - just another "magical" solution to a problem whose scale requires making clean energy cheap and massively shifting the world's energy supply toward low-carbon sources of energy. With just ten weeks until the world's nations meet in Copenhagen this December to try to hammer out a global consensus on efforts to reduce greenhouse gas emissions and build a global clean energy economy, WattHead.org's Jesse Jenkins returned to KPFA radio Monday to discuss the coming climate and energy policy debates in the U.S. Senate and on the international stage. Jenkins joined host Mitch Jeserich and Dan Jacobson of Environment California on this week's segment of "Letters to Washington," which aired Monday on KPFA radio in the Bay Area and was syndicated throughout the country this week. In 1798, a new federal agency began its life in a one-room laboratory to provide health care for merchant sailors. It covered the costs of this service by sending a single clerk from across the country to collect 20 cents per month from each sailor. This agency, originally the Merchant Health Service, gave birth to what today is the National Institutes of Health. And the NIH should serve as a model for where we need to go on energy research and development in America. The NIH is extremely effective at what it does. A new report by Northwestern University's Kellogg School of Management says the NIH plays a "central role" in medical innovation. According to the Congressional Joint Economic Committee, the NIH was "instrumental" in funding 15 of the 21 major breakthrough drugs from 1965 to 1992. Fifteen of 21 major medical breakthroughs - that mean 71% of our medical progress has come through NIH. That's a terrific investment. As the JEC study shows, funding goes out; very smart people use it; we get good results. The reality is that the current scheme of funding for energy R&D alone is not enough to drive innovation at the pace or scale required to spark a clean energy revolution. Despite the very good work many of our national energy labs conduct, the reality is that the Department of Energy was not intended to conduct energy R&D that is connected to commercial development and consumer use. DOE was born from disparate nuclear weapons and energy agencies. Sixty-three percent of its funding in the FY08 budget and almost 50 percent in FY09 was for nuclear weapons management and clean up. Simply put, this department is not currently set up to spend the $15 billion in new R&D funding we believe is necessary to transition to clean energy. That's why we are proposing the creation of a National Institutes of Energy (you can read our new report). It is easy to understand and generate public support, centrally coordinated but regionally based and outside of the current DOE research framework. NIE's mission would be clear: to fund and conduct commercially viable clean energy research. This is important not only for researchers but also for the Congress, which needs to fund energy R&D and the public, which supports government-sponsored R&D when it's tied to institutions they trust. While we would also base the centralized coordination of research on NIH's model, it's important not to tie research to a single campus inside the Beltway. That's why an NIE would leverage the expertise we have across the country by creating and overseeing a network of regionally-based, applications-orientated energy innovation institutes that already exist at the nation's research universities, national labs and in the private sector. It would, however coordinate this in Washington to avoid waste and overlap. Finally, to ensure that NIE is able to carry out its mission without institutional distractions, we would place it nominally in DOE. But just as with NIH, which is part of HHS, we propose providing NIE its own congressional authorization, budgetary authority and staffing autonomy. Don't take my word it for it. Even libertarian Rep. Ron Paul (R-TX) supports NIH. "[O]ur country's preeminent research institutions, and represent our greatest hope for finding cures and treatments for the chronic diseases and debilitating conditions that afflict millions of Americans. NIH research is also an essential factor in containing soaring medical costs that threaten the viability of our nation's health care system." The United States needs the same support for new clean energy research and development. We can get it with a National Institutes of Energy. Senator Sherrod Brown (D-OH) and leading DC-based think tank Third Way are the latest political figures to issue a call for significantly increased public investment to catalyze clean energy innovation. The Ohio Senator and the moderate progressive think tank joined the Breakthrough Institute today to unveil a new report calling for both the creation of a "National Institutes of Energy" and a dramatic increase in federal funding for energy research and development. The report, titled Jumpstarting a Clean Energy Revolution with a National Institutes of Energy, argues that these two measures are necessary to make clean energy cheap and get America running on clean energy. "Clean energy is the future of our nation, but it can also create jobs now - in Ohio and across the Midwest," Senator Sherrod Brown said. "Done right, increased research and development of new clean energy technologies will drive innovation and reduce our dependence on foreign energy. Already in Ohio entrepreneurs and workers are leading the way." "Our nation has a history of rising to meet pressing challenges by investing the resources necessary to overcome them," said Jesse Jenkins, Director of Energy and Climate Policy at the Breakthrough Institute and one of the report's authors. "Now, America must dramatically increase our investment in clean energy research and development and employ new and effective models to put that money to work. Clean, cheap energy technologies are needed to revitalize our economy, secure the nation's energy independence, and avert the risks of climate change," Jenkins added. Modeled after the National Institutes of Health, a New National Institutes of Energy (NIE) would be designed to most effectively channel R&D funding toward the development of new, low-cost commercial clean energy technologies. The NIE would function as a nationwide network of regionally based, commercially focused, and coordinated innovation institutes. Alongside other effective research institutions, the new NIE would critically strengthen the nation's energy innovation capacity. The report also calls for a sustained increase of $15 billion in annual federal energy R&D funding, consistent with President Barack Obama's proposals. This would result in a total annual R&D budget of roughly $20 billion per year. The purpose of both the R&D increase and the establishment of a new NIE is to close what the authors call "the clean energy price gap" - the difference between the current low price of carbon-intensive energy production like coal and the comparatively higher price of today's non- or low- carbon emitting technologies. "Getting America running on clean energy is the defining challenge - and opportunity - of our time," said Josh Freed, a co-author of the paper who runs Third Way's Clean Energy Initiative. "Establishing a National Institutes of Energy and fully funding R&D will drive the research that will lead to the next generation of clean technologies. These not only will fight global warming, they will allow the United States to be the energy leader in a carbon-constrained world." The authors also point to Energy Secretary Steven Chu, who has said that it is a "myth [that] we have all the technologies we need to solve the energy challenge... We need new technologies to transform the [energy] landscape." The authors argue that their proposal would create the structure and provide the funding the United States needs to transition from an aging, insecure energy infrastructure to clean, cheap energy. Neither the private sector nor the federal government is currently meeting these needs at a time when other nations around the world, including China, South Korea and Japan, are dramatically increasing their clean energy funding. Both groups also lauded the involvement of Senator Brown, who keynoted an event on Capitol Hill today to release the new report. "Sherrod Brown has been a leading voice in the Senate calling for energy reforms that helps to transform and save the American manufacturing sector. He understands that the best way to do that is for America to develop the technologies that will close the price gap and make clean energy cheap. This will help create the kind of jobs and industries we need to have a thriving economy in the 21st century," said Michael Shellenberger, President of the Breakthrough Institute. Freed added that Third Way "looks forward to continuing the work with Senator Brown that we have kicked off here today." U.S. Congressman Rush Holt (D-NJ) also joined the event to make brief remarks in support of the Breakthrough Institute and Third Way's efforts to advance critical clean energy research investments. The carbon prices established by the American Clean Energy and Security Act recently passed by the House "will not be enough," the Congressman explained, to spur clean energy research and ensure we have the technologies we need to achieve deep emissions reductions. Congressman Holt, who holds a PhD in Physics, warned that if the U.S. does not invest significantly more in clean energy research, "We may find ourselves five years from now, after we've deployed the technologies we have ready today and picked that low hanging fruit, and we're going to look around and say, 'Who was in charge of inventing the next generation of technologies we need?' ... The Market is not just going to do that for us." Despite differences in their views on the energy bills currently before Congress, Third Way and the Breakthrough Institute said that the two groups had joined together to highlight the critical importance and urgency of energy R&D to the nation's economic future and the fight against global warming. Third Way can be found on the web at www.ThirdWay.org. The Breakthrough Institute is at www.theBreakthrough.org. A copy of the full report, Jumpstarting a Clean Energy Revolution, can be downloaded here. Any questions about the report can be referred to Jesse Jenkins at jesse@theBreakthrough.org. Greenpeace, through its alter ego, CROC, is bringing the "magic" and "logic" of carbon offsets to the masses. Check out the video and follow CROC on Twitter @itsacroc. Clean Energy Centers Growing Worldwide, Not in U.S.
"Other countries, China being one of the major examples, are investing very heavily in this space across the whole innovation pipeline...from shower to power, from the idea in the shower to generating the power (in a) commercial scale enterprise." Just yesterday, the China Greentech Initiative released a report describing how large-scale government investment is driving a clean energy market that could be worth upwards of US$1 trillion annually. While China is home to some of the fastest growing clean energy centers, particular in the solar industry, Denmark, Japan, South Korea, India, North Africa, Singapore, and Abu Dhabi are all directly investing in creating domestic clean energy hubs. Executives in Silicon Valley, who have become accustomed to leadership in key technology industries like IT and semiconductors are starting to sense the shift in power. According to Reuter's, Weihl is calling for up to $30 billion in public funding annually for RD&D if the U.S. intends to remain a serious competitor in the clean energy race. Weihl also asserted that there is a "real danger" that the U.S., not to mention Silicon Valley, will not be a clean energy leader without this type of government commitment. Weihl's comments echo the Breakthrough Institute's call for massive public funding for clean energy RD&D in order to drive private financing and make clean energy cheap. The American Clean Energy and Security Act (ACES), currently awaiting congressional approval, however, would only invest $10-12 billion per year in clean energy, broadly defined. This investment does not stack up against long-term sustained government investment plans, like China's pledge to inject $440-660 billion over ten years into clean energy. Instead of incentivizing U.S. companies and venture capitalists to invest in the U.S. clean energy markets, the lack of cohesive U.S. government action on clean energy RD&D is already motivating private investors to center their interest, and money, in Asia. Currently, U.S. investment plans commit far less than the $30-50 billion that Breakthrough and business leaders, like Weihl, believe is necessary to drive the transition to a clean energy economy and make the U.S. viable in the increasingly competitive clean energy race. The China Greentech Initiative, a partnership of more than 80 largely Western companies and organizations, released a hefty report (registration required) today projecting that China's massive government investment in its "greentech" industry will drive follow-on private sector investment that could create a national market worth up to US$1 trillion annually. "Chinese government policies are positive drivers for greentech market development and...stakeholders have clear opportunities to accelerate market development..."
The report evaluates the market potential of a variety of "green" technologies including renewable energy and low carbon transportation, which are expected to be two of the largest growth sectors. Through strong policies and financial support, the Chinese government has been a major driver of China's clean energy markets. In addition to numerous fiscal incentives and subsidies for clean energy, China's economic stimulus plan allocated 37% of its US$586 billion ($4 trillion yuan) to "greentech" sectors. China is also planning a new stimulus to invest $440 to $660 billion over 10 years focusing specifically on renewable energy. "China's wind power capacity, for instance, has doubled for four consecutive years since 2005, with China now ranking fourth in the world and representing 10% of total installed capacity." Based on recent estimates by the Global Wind Energy Council, installed capacity will double yet again by the end of the coming year, making China's the largest wind energy market in the world. The Chinese solar market is poised for take-off as well, and reports suggest that the government will soon introduce a feed-in tariff for solar electricity. China is already the leading solar manufacturer in the world, and exports more than 95% of its solar cells, according to the report. China is also vying for leadership, primarily with Japan, in electric vehicle production. As the New York Times reported in April, it aims to be a world leader in EV production within the next three years and plans to increase its production to 500,000 hybrid or all-electric vehicles by 2011 up from just 2,100 in 2008. The government is offering research subsidies along with planned tax credits for consumers to help make this ambitious goal a reality. In addition to these advances, the report suggests there is plenty of room for China to expand its clean energy sector. And even though the government will continue to play a leading role in China's clean energy markets, stakeholders, including the private sector, still have significant room to speed the growth of these markets. The report outlines a variety of ways in which private companies can capitalize upon these burgeoning industries. The Greentech report is just one more indication that there is widespread recognition of China's growing dominance in the clean energy race. In August, GE's CEO, Jeffrey Immelt and Kleiner Perkins' John Doerr penned an op-ed explaining that the lack of a sustained government commitment to clean energy in the United States is causing it to lose its competitive clean energy technology edge and that, without significant public investment in clean energy, it may cede clean energy leadership to the Chinese. Both GE and Kleiner Perkins are members of the Green Tech initiative. Some analysts have suggested that China's massive government investment in clean energy represents a "Sputnik moment" for the United States, which has thus far made comparatively little progress in clean energy technology relative to its Asian competitors. By contrast, the U.S. is planning to invest approximately one-fifth of what China has planned to invest in clean energy technology. A recent Center for American Progress study reveals that clean energy investments from the U.S. economic stimulus package (ARRA) and potential investment from ACES, the climate and energy legislation under congressional consideration, could drive a combined $150 billion per year in public and private investment, mainly from the private sector. But the majority of the follow-on investment would be generated by the direct public investments put forth in ARRA, a short-term plan, not the more indirect market incentives created by ACES. By demonstrating China's many realized gains from the clean energy sector and the potential for future market growth as a result of large-scale government investment, it is particularly telling that this Greentech report is predominantly led by prominent U.S. companies. In the absence of a stable, long-term clean energy public investment strategy in the U.S., it is apparent these companies will look to China as the new center of the global clean energy industry. The New York State Senate and Assembly, too often a model of corruption and dysfunctionality, rose above petty politics last week to pass forward-thinking legislation on climate and energy, setting a precedent for bipartisanship and a sensible cap and trade system. The State Senate passed the groundbreaking Green Job/Green New York Act, with strong support from Republicans, Democrats, and the Working Families Party, which spearheaded the legislation. The bill—expected to be signed into law this week by Gov. David Patterson leverages $112m in revenue from the Northeasts’s Regional Greenhouse Gas Initiative (RGGI)into $5 billion of private investment to finance home weatherization, energy efficiency projects, and green jobs creation. 1) It is one of the first large-scale pieces of legislation that concreteley demonstrates why green jobs are a win-win-win. Homeowners win by reducing their energy costs. The private sector wins by gaining a safer investment with strong expected returns. strong return on investment. And New Yorkers benefit through the creation of 16,000 new jobs and the increased economic activity and tax receipts the program will generate. It’s a blueprint that can work other states and regions as well. 2) It’s also a model for sensible national climate and energy policy. While the version of the American Clean Energy & Securities Act that passed in the House gives away a substantial portion of the pollution allowances to utilities, the RGGI program in the Northeast auctions off the credits creating the $112 million in revenue, which the state is leveraging 50x to create new jobs and save homeowners on their heating and electricity bills. 3) Finally, the Green Job/Green New York Act highlights the power of bipartisan efforts to achieve common sense solutions. Republican support is what made the bill possible. Rather than fight any effort for sensible policy like the national Republican leadership, local leaders have proven to be in touch with the concerns of their constituents, helping to pass the bill 52-8 in the Senate and 147-0 in the Assembly. But putting politics aside and the needs of New Yorkers first, they showed the way for national cooperation on this issue. To learn more about the bill and its passage, check out David Sasson’s piece on SolveClimate.org. This entry is cross-posted on Grist.org. As I reported last week, a moment of truth has arrived for the U.S. Environmental Protection Agency (EPA) and President Barack Obama, who has promised “unprecedented steps” to rein in the devastating practice of mountaintop removal coal mining that is wrecking havoc across wide swaths of Appalachian mountains, valleys and communities. Last Friday, EPA announced the preliminary fate of 79 pending permits associated with mountaintop removal coal mining sites across Appalachia: No go! the Agency said, granting stays of execution to every single permit and ruling that none of the 79 permits be streamlined for approval. It's a move that coalfield residents and community and environmental activists have cautiously hailed as a sign that EPA may finally be moving to protect Appalachian mountains, valleys and streams - and the communities and ecosystems that call them home - from the ravages of mountaintop removal mining. "No amount of "regulation" will make it economically sustainable or environmentally beneficial to blast the top off some of the oldest mountains in the world and dump the waste into headwater streams," said JW Randolph of Appalachian Voices, a leading organization working to end mountaintop removal and protect Appalachian communities. Instead of traditional subsurface mining, coal mines utilizing mountaintop removal (MTR) use huge amounts of explosives to decapitate mountains and access the coal beneath, dumping the remains of these once-verdant Appalachian peaks directly on top of neighboring valleys and streams. Mountaintop removal mining has already buried more than 800 miles of Appalachian streams and destroyed hundreds of square miles of woodlands in one of America's biodiversity hotspots, all while both the U.S. EPA and state environmental agencies have done little to curtail the practice. That's left it to activists and litigation to slow these projects down and prevent their irreversible damages - until Friday at least. This decision is not final, but is part of an ongoing coordination process between the Environmental Protection Agency, the Army Corps of Engineers, and the Department of Interior to deal with a backlog of permits held up by litigation over the past few years. The Army Corps has already green-lighted the permits under their review process but EPA, which must also examine permit applications and determine whether or not they pose a "significant" environmental risk, has promised a more stringent and transparent review of all mountaintop removal valley fill permit applications. The initial stay of execution from EPA headquarters indicate that every single one of these pending projects do in fact pose an environmental risk and warrant further review. Regional EPA offices now have 14 days to review and comment on the EPA Headquarters’ recommendations, after which EPA Headquarters can finalize the list of environmentally risky projects. If the EPA Regional offices agree with the EPA Headquarters’ assessment that these permits have “substantial environmental concerns,” an “enhanced coordination” process will begin, where the EPA and the Army Corps will study each permit on a case-by-case basis. The beginning of each coordination process sets off a 60-day period during which the two agencies must resolve any permit applications. The EPA reserves the right to exercise their veto authority over any of the unresolved permits. "Bottom line is that, based on their own science, EPA needs to veto every single permit," said Randolph. "How does any MTR/valleyfill operation not have a significant environmental impact? Its insanity. We've been talking about mountaintop removal so long that we can say "burying 10 miles of streams" and not bat an eye. Its just insanity, and its got to stop." The Breakthrough Institute and Third Way have prepared a new report detailing how the United States can jumpstart a clean energy revolution through investing in research and development and creating a National Institutes of Energy (akin to the NIH) to spur the development of innovative clean energy technologies. Breakthrough Institute, Third Way, and U.S. Senator Sherrod Brown (D-OH) will be holding a forum detailing the findings of Third Way and the Breakthrough Institute's new paper and describing how a focused program of innovation will help make promising clean energy technologies a reality and create a clean and prosperous energy economy. Please see the event details below. We hope you can join us for this exciting event! Please RSVP to rsvp@thirdway.org and indicate this event. If you have any questions, please contact Jen Pengelly at 202-775-3768 ext. 214 or jpengelly@thirdway.org. ABOUT THIRD WAY: Third Way is the leading think tank of the moderate wing of the progressive movement. We work with elected officials, candidates, and advocates to develop and advance the next generation of moderate policy ideas. For more information about Third Way please visit www.thirdway.org. Portland General Electric is a friendly company which likes to reassure Oregonians that their local utility is concerned about the planet. PGE will let you sign up to purchase renewable power, so the money you pay on rates goes to fund clean energy projects. The company’s homepage highlights how PGE is helping the owners of small, sustainable businesses. PGE’s been known to purchase advertising space on the sides of Portland’s MAX lightrail system, that read “I heart ice caps” above an image of gently turning wind turbines. And oh, yeah – PGE also wants to lock the state of Oregon into 30 more years of coal dependence. PGE owns Oregon’s Boardman Coal Plant – the only coal-burning plant in the state. Fortunately, this month the company had a chance to show customers that it understood coal is over, and planned to move away from coal dependence as fast as possible. That’s because PGE was scheduled to release a draft plan of the Integrated Resource Plan that it releases every two years, to explain how it plans to meet its energy needs for the next two decades. PGE considered many possible scenarios, including options that would have involved phasing out dependence on Boardman. Unfortunately, PGE decided that the best option for Oregon’s energy future is actually to increase our reliance on Boardman, keep the coal plant open at least until the year 2040, and build two new natural gas plants by 2015. Oregon has some of the most progressive greenhouse emissions-reduction goals in the nation, and PGE’s plans are clearly at odds with state targets for cutting pollution. It’s safe to say PGE knew this, and it’s worth speculating whether that had something to do with why the company waited until late on the Friday before Labor Day Weekend to release its report; possibly they hoped this would decrease the odds of the press taking notice. If so, the strategy didn’t work: a pretty nice story about PGE’s draft plan made front-page headlines in the Oregonian Saturday morning. Oops. The truth is, Oregon is perfectly positioned to become the first state in the country to sever its reliance on coal completely. Shutting down Boardman and replacing it with renewable energy would result in less than a 1/2 percent increase in consumer rates over the next 30 years. Meanwhile, keeping the plant open will require PGE to spend nearly $600 million of ratepayer money to pay for pollution controls that do nothing to curb carbon dioxide pollution. Studies show the Northwest can meet 85% of new energy demand over the next twenty years through energy efficiency measures alone. PGE won’t get away with these coal-tinted shenanigans. Anti-coal activists in Oregon already have some pretty cool projects in the works that will increase the pressure on PGE over the next several months, and highlight the ability of the Northwest to be a leader in renewable energy. The public has until October 5th to comment on PGE’s draft plan, and there are lots of opportunities coming up for citizens to let the company know coal is over. While its disappointing that PGE is trotting out 19th-century “solutions” to Oregon’s energy problems, this month’s draft report is not the final word. The real lesson we learned this month is where PGE will stand as citizens and governments in the Northwest work to create a clean energy future for our region. We will make that future a reality, but PGE is going to drag its feet and kick and scream every step of the way. At a time of great danger and immense opportunity, PGE has placed itself squarely on the wrong side of history. And those cute wind turbines on the MAX train just aren’t going to make up for that. A recent RAND Review provides a slew of recommendations to help China expand the Tianjin Binhai New Area (TBNA) and turn it into a driver of economic progress. As a result of an enormous stimulus package (second only to that of the U.S.) with significant allocations for "indigenous innovation" in science and technology, China may already be well on its way to taking those suggestions to heart, particularly in the clean energy sector. Tianjin Binhai New Area (TBNA), located in China's Bohai Rim region, has been a strong center for modern industry and manufacturing. But in 2006, the Chinese government mandated that TBNA become the next "regional engine for economic growth." To that end, the area has been the beneficiary of significant government support aimed at making the area the country's next "economic powerhouse" and orienting it towards leadership in providing solutions to national problems: among them, rising energy demand. "The goal of TBNA is to present an alternative to the traditional industrial economy, offering China a model of sustainable development and eco-friendly industry. Innovation in science and technology lies at the core of this vision of economic and environmental development." In the report, RAND offers TBNA guidance in its endeavor to meet China's growing technology needs, both domestically and internationally, by recommending that it pursue seven emerging technologies including cheap solar energy and electric-hybrid vehicles. In terms of solar energy, in particular, China may already be well ahead of the learning curve. RAND believes TBNA should become the research, development, and manufacturing center of second and third generation solar technology with a short-term focus on the global export market and a long-term eye for its domestic market. China, however, is already the world's leading solar power manufacturer and its leading photovoltaic (PV) provider, Suntech, is on track to be the second largest provider in the world after America's First Solar. Furthermore, China has the largest solar manufacturing capacity in the world, responsible for about a third of global capacity. It is expected to lead the world in cell capacity in the coming years. Just this week, the Chinese government inked a deal with First Solar to install a 2GW PV power plant, the world's largest, in the Mongolian Desert. RAND also recommends that TBNA work to make these solar energy systems cheap and accessible to developing and undeveloped countries. Given the progress China has already made in the solar sector and the government support that TBNA is receiving, it is well-positioned to follow through on this crucially important suggestion. Government support for TBNA is not occurring in isolation. Instead, it is just a part of a large-scale effort, backed by money from China's $586 billion (RMB4 trillion) stimulus plan, to strengthen its national science and technology programs by emphasizing "indigenous innovation." "[A] new technological and industrial revolution centered on green energy, artificial intelligence, and sustainable development is most likely to take place in the next 10 to 20 years. 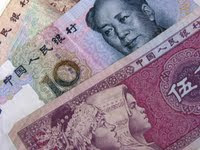 China must prepare itself for the new revolution in order to build a well-off society and realise China's modernisation." "The Chinese are hoping to catch that [technological innovation] wave. That's part of their stimulus package thinking, that as the world comes out of this downturn, with it will come a whole wave of new innovations probably built around new energy, new materials. The Chinese want to make sure that they're at the forefront of this and aren't laggards." On the clean energy front, China's clean energy investment plans, as well as its recent solar partnership with U.S. makes it out to be anything but a "laggard." Instead, China's ability to rebound from economic crisis by turning its stimulus funding into an innovation opportunity will not only position it to lead the clean energy race, but also prepare the way for China to become the world's next leader in scientific and technological innovation.